Explore your creative talents and produce amazing artworks on your iPad. You don't have to be an artist to achieve great results on your iPad, and this refreshingly accessible book is perfect for skilled artists and creative wannabes alike. Alongside the step- by-step projects that teach the fundamentals of digital painting, there are also some easy and fun artistic tricks that anyone can try. Enjoy painting with none of the mess or need for expensive materials! You'll master the most popular art apps like Brushes and Art Rage, which have been downloaded tens of millions of times, and you will learn new painting and drawing skills along the way, whatever your painting ability. iPad users young and old are fans of its powerful graphic potential, and this book will give skilled painters the knowledge they need to apply their expertise digitally. Including such diverse tutorials as "What Would Bansky Do? ", "The 30-Second Portrait Portrait", "The Purrrfect Cat" and "The Not-So-Still Life", this is the must- have book for any aspiring iPad artist. 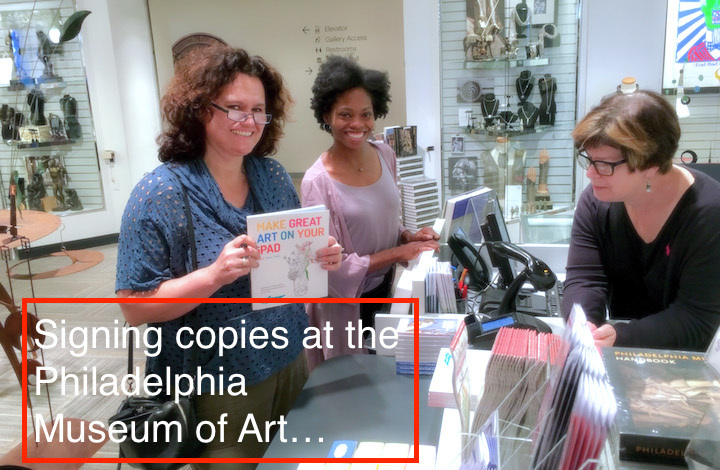 I am thrilled to report that "Make Great Art on Your iPad" is now for sale in many world-renowned art institutions, including the Museum of Modern Art (NY) , The Metropolitan Museum of Art, The Royal Academy in London, the Tate Gallery in London, and the Philadelphia Museum of Art! If it's not in YOUR local art museum giftshop, please request it! Maybe I will be able to arrange a signing event! This book is so much better than anything that I have previously read about making art on your iPad. Most publications seem to start from the point of view that you are an imbecile that doesn't have a clue about the equipment or software being used, this book assumes that you know how to turn on your iPad and open an app and gets straight to the point of how to make art using the hardware and some representative, artistic software. Anyone who knows how to use a tablet or smart phone should be able to develop their artistic skills by reading this book and practising the various techniques described. You do need to have a basic knowledge of the apps that you will be using for the various projects but this can quickly be learnt with user manuals or online resources such as YouTube. Overall, I think this is the best book of its kind that I have read so far." Alison Jardine is a British artist and author living and working in Dallas, TX, who works across a broad range of disciplines, including new media, sculpture and painting. In 2010, she completed a 365-day project to make and share a drawing a day on her (then new) iPad. At the end of the year, she was hooked!